Noragami shines with its own charms on various terms. For instance, we have a young girl who is selfless, brave, and eager to help others in need. She puts others before herself and her actions often speak louder than words. Despite her life being seemingly changed forever, she doesn’t blame anyone for it but rather hopes to use her new abilities to continuously help others. This brings her in terms with then narcissistic God, Yato. Their relationship is odd at first with the duo often complaining and arguing about seeming events of little importance. Despite that, they are surprisingly entertaining to watch in particular Yato. He makes the time fly fast with his characteristics as a God by helping others but not without a price. (Charging 5 yen for a completed task) It stands out for the fact that Yato helps others for his own personal gain rather than just ‘doing the right thing’. With this setup, you can guess why Yato and Hiyori often get into debates. These are often comical because, in some ways, they are compatible. Hiyori is no shadow to be stepped on despite her kindness. She is able to stand up for herself and take responsibilities. Similarly, Yato has a natural sense of humour with a sense of himself. Sometimes, his behaviour reflects human emotions such as regret, jealousy, and solitude. Despite being so different, Yato and Hiyori have special relationship viewers will feel attached to. One character, however, isn’t actually a ‘fan favourite’, well for me he isn’t anyway. Meet Yukine, a wandering spirit that Yato made into a weapon for his job. His personality isn’t particularly likeable either, he acts just like his age as a brat, he isn’t mature and he doesn’t have a sense of humour. Despite being a spirit, he acts like a human. It is somewhat acceptable at first to understand where he came from – a child who missed the opportunity of a normal life as evidenced by some flashbacks.Yukine becomes a character that is developed by deconstruction. Rather than having him remain like a brat, he undergoes through phases and reflects his change in a way that he seems like a whole new person. Noragami depicts his character at his best with this change that shows development in a way that is humane, credible, and stands as a visage of redemption. What I loved most about this Anime, was the story. There are various themes explored in the series include suicide, bullying, revenge, and temptation. There is also bits of fantasy too. The sotry itself sticks with the premise of exploring concepts involving dealing with Phantoms, beings of the supernatural world that inhibits in the world of the living. As the plot is unravelled more and more, we also find more about Yato’s past which seems to be ominous. One particular character holds a deep grudge for Yato in cat-and-mouse like game throughout the series. It sparks curiosity to viewers as Yato’s past life as compared to his present. But with new friends, it also sets up a contrast between the two stages; it makes Yato view his weapons as a different light, perhaps as friends rather than just tools of war. The art style of Noragami is simple yet magnficiant at the same time. Taking place in the modern world means that nothing should be out of the ordinary. Yet, we get those spirits decorated by malevolence as harbingers of destruction. Background designs also make its point with the suburban city combined with traditional Japanese themes such as shrines and altars. The character designs sparks curiosity such as Hiyori’s tail. Yato’s artwork design also looks interesting with his electric blue eyes, tough attitude, and jersey that comes with a scarf. A strength that brings the action-packed scenes of Noragami would be the soundtrack. The OST elaborates on the solid movements of the characters. No movement is wasted and all of them matches consistently with its well-coordinated orchestra. The OP song by Hello Sleepwalkers is probably one of OPs of 2014. It was really cool. The ED song “Heart Realize” is also one of my favourite ending songs as well. I am not typically one to really care about ending songs, typically I skip them because they don’t foreshadow that’ll happen in the next episode. However, for this ED I made sure to stay every time. 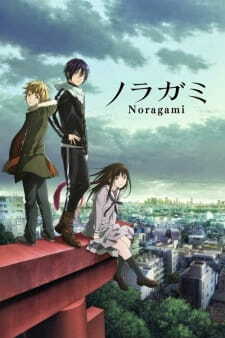 I loved the first season of Noragami. Haven’t seen the sequel yet, but I will try to do so over the summer. I like reading about other people enjoying it as well. I really enjoyed Noragami as well. I don’t mind Yukine that much, and by season two he actually grows on me a lot and I begin to really like his character. But yeah, he’s definitely a brat for most of season 1. Still, this anime is just so much fun to watch, and I totally agree with you about the soundtrack.